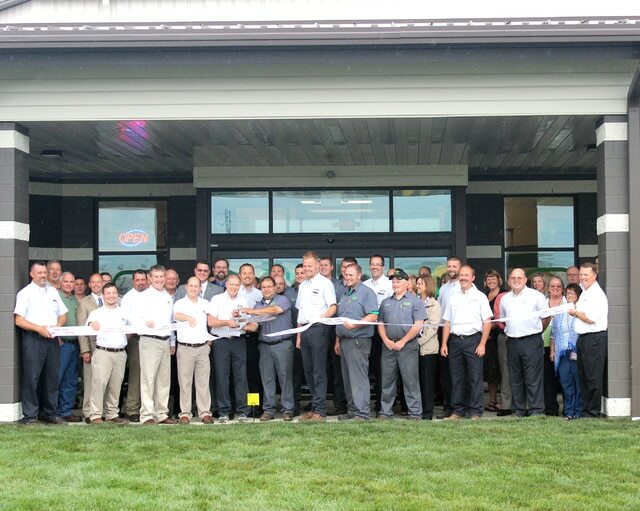 GREENVILLE — Koenig Equipment Inc. held a two-day grand opening celebration Friday and Saturday to officially welcome the community to its expanded facility and showroom. “It’s great that a Darke County agricultural business is expanding. They’ve built this beautiful facility and today everybody gathered together, including the Cattlemen’s, Pork Producers and folks around the community to celebrate this great event,” said Matt Aultman, chairman of the Darke County Chamber of Commerce. The chamber held a ribbon-cutting on Friday. Both days of celebration included informational activities, events and special offers on equipment and product support for agricultural and residential customers. The expansion took the full-service John Deere dealership from 24,000 square feet, at its old location on State Route 571, to 30,000 square feet at its new facility at 5155 Children’s Home-Bradford Road. The new showroom is triple the size of the old one, said Operations Director Eric Moore. The large showroom showcases John Deere tractors, riding lawn mowers, merchandise, and accessories, Stihl blowers, trimmers and chain saws Honda Power Equipment walk-behind lawnmowers, and most recently, Tarter Farm and Ranch equipment. Outside, a large lot showcases the latest in agricultural equipment from John Deere including tractors, material handling, harvesting and hay equipment. “This new facility enables us to serve customers more effectively, more efficiently and more safely. It shows our long-term commitment to and appreciation of the customers, communities and industries that sustain us,” said Moore. Moore explained that the facility had both turf and ag-related products and is considered a combination store, the only one in the surrounding area. Founded In 1904 by John C. Koenig and supported by three successive generations of the Koenig family, Botkins Hardware Company grew into Koenig Equipment. Koenig Equipment is a local farm equipment dealer proudly serving the agricultural communities and residential property owners in Ohio and Indiana. With 11 locations across two states, Koenig features John Deere equipment and also specializes in brands such as Tarter, Stihl and Honda Power Equipment. In 1991, Koenig Equipment Inc. purchased Girberts-Greenville and Hency-Arcanum dealerships and consolidated in Greenville. July 18, 2014, Koenig Equipment Inc. officially broke ground for the new full-service John Deere dealership relocating from the State Route 571 facility. The store hours are Monday-Friday, 8 a.m.-5 p.m. and Saturdays, 8 a.m.-noon. During busy seasons the facility will be open expanded hours Monday-Friday, 7:30 a.m. – 7 p.m and on Saturdays 7:30 a.m.-4 p.m.